Heat a spoon of oil and saute ginger and green chillies for 10 seconds. 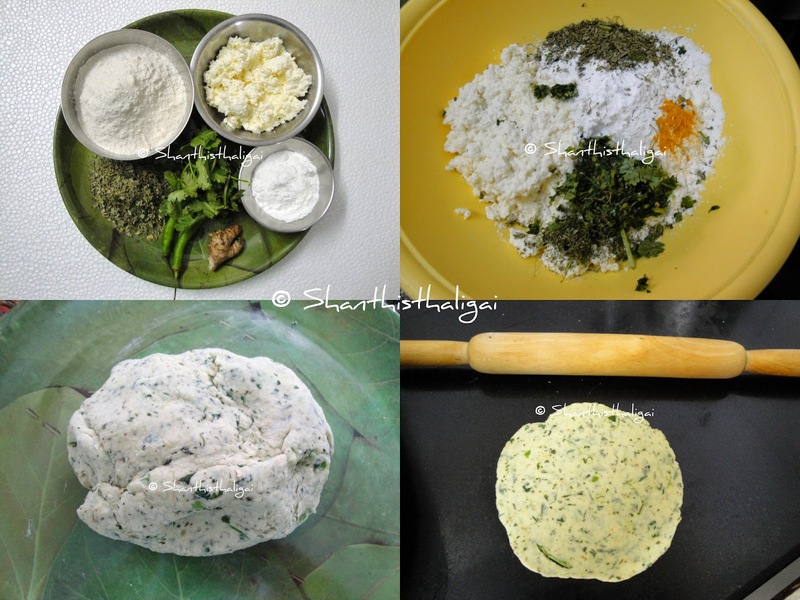 Grind alongwith coriander leaves to a coarse paste. Take an easy to knead bowl and add all ingredients. Add a spoon of oil and mix well. Add water little by little and knead it to a stiff dough. Knead well. Make small balls out of the dough. Flatten each ball with a roller using oil, and roll it out to a small poori. (Oil for frying will be very clear if the dough is flattened with oil. Do not dust with flour). Heat oil in a pan and when hot, drop the rolled kachori gently into it. Flip on both sides until golden brown. Serve hot with pickles. NOTE: This goes well with pickles. This tastes good as it is, without any side dish. Easy peasy recipe? Like the pooris' look. Must try sometime. Looks very tempting and tasty. paneer kachori looks very yumm..
will this taste good if done with Atta? ya it will taste good.